The destruction of the cathedral is not only a tragedy for Paris, but for the whole world. 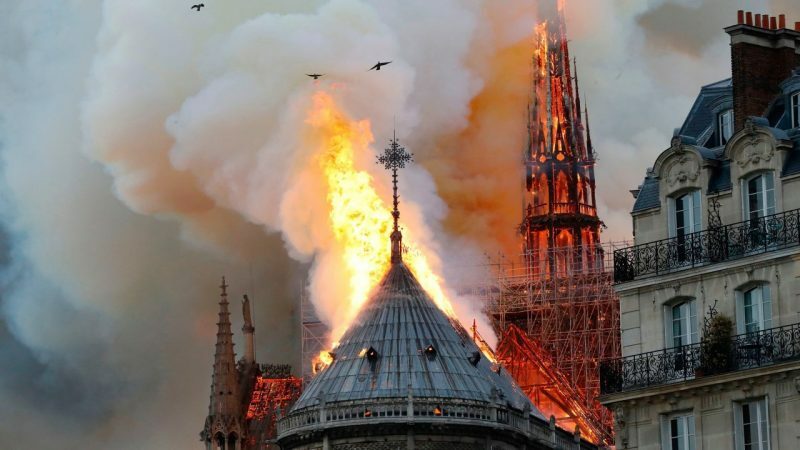 At 19.13 clock came the first message: Notre-Dame burns. From minute to minute it got worse, a tower collapsed, the roof collapsed, the fire spread inexorably, soon it was sad certainty: One of the most important cultural monuments is largely destroyed, the famous bells are silent. Shocked people were able to follow the news through agencies, including on the Internet and via social media – the ORF broadcast the “Millionenshow” and the old program “Vorstadtweiber” in the other program. Also, ARD and ZDF reacted very late life, which does not make it better. It was remembered in 1992 when the Hofburg was on fire (luckily completely rebuilt). Some might have thought of the much smaller Sofiensäle, which burned down in 2001. Now it would be stupid to balance disasters against each other. Nevertheless, the author must confess to these lines: The disaster of Paris at the beginning of Holy Week is howling! Anyone visiting this cathedral or just walking past it was impressed. Notre-Dame shaped the cultural metropolis like the Eiffel Tower. The Parisians have witnessed numerous tragedies in recent years. From the attack on the editorial board of the satirical magazine, Charlie Hebdo to the terrorist attacks in the context of the football match France against Germany, including assassination in the concert arena Bataclan – the city on the Seine was the most affected by terror. The protests of the yellow vests also met with indignation among the Parisians, because this politically committed only briefly to a goal and meanwhile anarchist group became independent and almost every Saturday traces of devastation leaves. However, people were not intimidated and tried to lead a normal, optimistic, future-oriented life as quickly as possible. That will be the case sometime after the catastrophe on the Île de la Cité. There comes the time when the church (or whatever is left of it) will shine in old splendor. Or in a new guise. Paris loves modernity. But now is time for mourning, not only in Paris and France, not just in the EU – the whole world has to cry for this cathedral. Humanity, not just Christianity, has lost one of its greatest treasures until further notice, an architectural wonder of the first order. If such a disaster happens in Paris, one thinks first of terror, which may not have been the case. Maybe it was really a seemingly trivial accident in renovation work, which had so much impact. But in such destruction, the cause almost does not matter, the effect of the bad. And those trolls who mockingly act as uninhabited atheists in the evening may like to hold the Goschen.